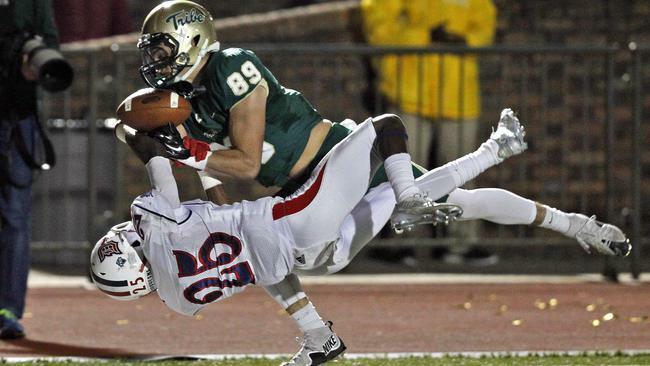 Duquesne DB Josh Jordan tackling William and Mary WR Daniel Kuzjak. Editor’s note: This story is courtesy of William & Mary and Duquesne athletics. WILLIAMSBURG, VA. — The No. 13 William & Mary football team advanced to the second round of the NCAA Playoffs with a 52-49 victory against Duquesne at Zable Stadium on Saturday evening. Although DU (8-4) jumped out to an early 14-0 lead less than six minutes into the contest, W&M (9-3) responded with four unanswered touchdowns and never relinquished the lead. Sophomore wide receiver DeVonte Dedmon led the Tribe offensively with three touchdown catches and 225 all-purpose yards, while junior running back Kendell Anderson rushed for 137 yards on 24 carries with two scores. Junior quarterback Steve Cluley finished the contest 11-of-15 for 251 yards with two touchdown passes. Despite being outgained, 540-480, and committing four turnovers, W&M posted its highest point total since scoring 52 in a win against VMI in 2008 en route to improving to 6-0 at home this season. DU quarterback Dillon Buechel provided much of the Devils’ offense, as he completed 33-of-53 passes for 423 yards with six touchdowns. Wideout Chris King accounted for 12 catches for 221 yards with a score, while Wayne Capers totaled three touchdown receptions. After recording a 71-yard touchdown pass from Buechel to King on the first play from scrimmage, the Devils built a 14-0 lead following a 6-yard toss from Buechel to Nehari Crawford with 9:14 left in the opening quarter. However, the College responded with four unanswered touchdowns to take a 28-14 advantage. The first two scores came on strikes of 38 yards and 24 yards to Dedmon that were separated by less than two minutes. A 3-yard touchdown run by Anderson early in the second quarter and a 2-yard score by senior running back Mikal Abdul-Saboor with 3:58 left in the half completed the stretch. Three of the four touchdowns drives came following big defensive plays – an interception by junior cornerback Trey Reed, a fourth-down stand and a stopped fake punt. Duquesne narrowed the margin to 28-24 with 10 points in the final minute of the half. Buechel connected with Crawford on a 9-yard touchdown pass with 41 seconds left, and Austin Crimmins made a 39-yard field goal with just two seconds on the clock. The field goal was set up after linebacker Carter Henderson intercepted Cluley at W&M’s 38-yard line. After a 20-yard field goal by sophomore Nick Dorka early in the third quarter, W&M went ahead 38-24 when senior free safety DeAndre Houston-Carson returned a field goal blocked by senior defensive tackle Tyler Claytor 65 yards for a touchdown. It was Claytor’s fourth block this season, while Houston-Carson returned a blocked PAT for a score earlier this fall. Duquesne appeared to answer with a kickoff return for a touchdown, but the score was negated by a questionable holding call on one of the Duke blockers. After the teams traded touchdowns late in the third quarter and early in the fourth – W&M’s coming on a 37-yard touchdown pass from Cluley to Dedmon — Duquesne continued to mount its comeback bid. Following a 5-yard touchdown pass from Buechel to Capers, Crimmins connected on a 35-yard field goal to draw the Dukes within 45-41 midway through the fourth quarter. The Tribe followed with a seven-play, 68-yard drive that ended with an 8-yard touchdown run by Anderson with 3:17 remaining. All seven plays came on the ground. A 42-yard touchdown pass from Buechel to Capers with 1:11 left, which was followed by a successful 2-point conversion, narrowed the margin to 52-49, but Houston-Carson recovered the ensuing onside kick and W&M ran out the clock to preserve the win. In addition to his special teams touchdown, Houston-Carson totaled 10 tackles, while Reed finished the game with a career-high 11 tackles to go with his interception. Sophomore cornerback Raeshawn Smith also posted a pick, while Claytor’s stat line included a sack and two tackles for a loss in addition to the block. Duquesne’s football team jumped out to a 14-0 lead and scored 49 points on the day, but came up just short in its first playoff appearance at FCS. Junior Dillon Buechel had career highs in attempts (33), completions (53), yards (423) and touchdowns (6) while senior Chris King had personal bests of 12 receptions and 221 yards. Senior Wayne Capers, Jr. tied a career high with seven catches for 81 yards and had a personal best three touchdowns. Buechel tied the school record with six TD passes set in 2008 and was also the first Duke to throw for 400-plus yards since 2008 while King was the first DU receiver since 2002 to post 200-plus yards receiving. W&M will return to action when it plays its second round game at Richmond next Saturday at noon. The two teams met in the regular-season finale on Nov. 21 when the Spiders earned a 20-9 victory. The game will be broadcast by ESPN3.